Parents and dog owners know this already. When we ask our child to take out the trash, do their homework, or help tidy the kitchen and they willing cooperate, what happens? They get a reward, right? We smile and give them praise, a star on their chores chart, and maybe even dessert. When cute little Fido or Fifi poops outside or comes when we call them, what happens next? They get a treat, right? There is something to be said for immediate obedience, isn’t there? When we love someone, we want to do what they ask us to do. I know as a mom, it makes me happy when my children obey me without hesitation. I love it even more when they do it without me asking them. Did you ever stop to consider that God likes immediate obedience even more? What do you think would have happened if Mary had said “It’s not a good time right now,” when the angel told her she was going to be pregnant with the son of God? What about if Jesus had said “I don’t feel like it” when it was time to go to the cross? God is looking for people who will respond in immediate obedience. But we humans have a tendency to make excuses and put things off, don’t we? When I put off things God has told me to do, I get that nagging feeling that keeps me from being at rest in my spirit. I can’t seem to move forward in the other areas of my life. It’s like God is saying “Take care of this first and then I’ll show you the next thing.” Many of us want to be used by God, but we don’t want to follow His timetable. Do you ever get that nagging feeling? Ever feel like you want to move forward but for some reason you are being held back? Could it be that God has asked you to do something you have not yet done?If you think about it for a bit, I’m sure God will reveal it to you. If you enjoyed this post, please click on the like button and until next time, keep looking up! What is it that you have been putting off? Starting that diet or exercise program? Sticking to that budget? Getting your business going? Finishing that degree? Joining a church or getting serious about your relationship with that special someone? How many times have we said “Well, I’m not quite ready.” Or, “Maybe next time.” Or how about “I’m going to pray about this for a while.” Sound familiar? How many times have I missed out on tickets to a concert or event because I was still “thinking about it”? What have you missed out on because you were still “thinking about it”? In my book, “The Power of Faith”, I talk about how God told me it was time to commit to my church. Previously, I had been going to different churches every few months or so, depending on what the sermon series was at the time. I was like a sponge and wanted to soak up as much as I could of God’s word and teaching so I’d venture from church to church around town. It’s time to join the church. All sorts of doubts crept into my mind. I felt that my freedom was being taken away until it occurred to me that God just might want to use me at Trinity. And indeed He did. I started by becoming a greeter at the door. Then I moved on to being a small group leader at my house. Next I joined the devotional ministry. The possibilities were endless and I was learning all sorts of skills in the process. 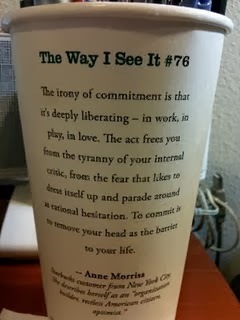 But commitment takes confidence, doesn’t it? We need to feel a certain comfort level about whatever it is we are about to undertake. If we let those two pesky critters “Doubt” and “Fear” crawl into our minds, we will never commit. We imagine all sorts of negative outcomes. And that, my friends, is where Faith comes in. I have found that having faith to commit to something new is kind of like Peter learning to walk on water. He had absolutely no skills whatsoever to do what Jesus was calling him to do, but what did Peter do? He stepped OUT OF THE BOAT! And He kept his eyes on Jesus, at least for a little while. The moment we take our eyes off Jesus and look at our own abilities, that is the moment we begin to sink. What is it that God is calling you to do, dear one? Are you willing to STEP OUT OF THE BOAT? When we step out of the boat into uncharted waters, God is the one who receives the glory. Get it? I hope this post has encouraged you to take action in some area of your life. I’d love to hear what God is calling you to step out and do, so send me a note or post a comment.